Uchikake are very wearable on the day (especially if its a winter wedding as you want photos outside) This one is synthetic and embroidered. Ooh, it’s a beauty. I like the look of what I can see of the tomesode underneath too. It looks to be a ryozuma one (mirror image design on the fronts), like pre WW2 ones, which I am particularly fond of. The ensemble looks great. Not all we non Asian people seem to be able to carry it off but you certainly do. Your bouquet has a Japanese look to it too and is perfect. Silk is lovely but the synthetic ones are just as beautiful, so I like them just as much. When my daughter, who models for me, tried on one of my uchikakes, so I could take photos to show my sister, she couldn’t bear the weight for long and could only hold her arms up for very short spells to show the sleeves. Some are heavier than others and it was a particularly heavy one she had on, with very thick embroidery weighing it down. The one the opera company bought recently was a fair bit lighter, having a woven design rather than couched embroidery, so hopefully the singer being Cio Cio will cope ok. I took the uchikake to the florist and he choose the flowers to match. 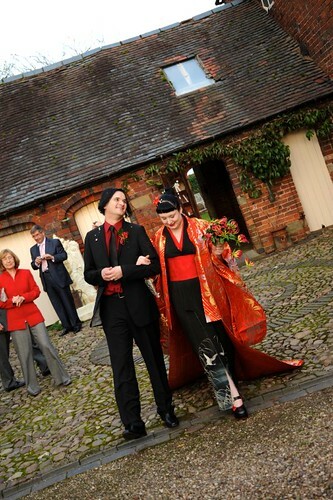 I brought the tomesode because I was going for a ‘red and black’ themed wedding. I think I remember it being around 1920/30’s according to the seller. The kimono does look like a Taisho one (1912-1926), ryozuma designs were popular then. Those often have a lovely red lining. 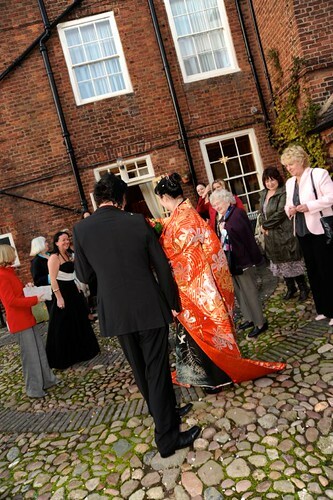 Your florist did well, he took the colours and Japanese look on board, they were the perfect choice. The wrong flowers or style of arrangement could have completely spoiled the effect.